As the Indian economy enjoys a sustained positive momentum, rural India continues to be the heart of the country, accounting for 67 per cent of the total population and 37 per cent of its GDP. Agriculture is the primary occupation of rural households and mainstay of their socio-economic structure. While the overall Indian economy is expected to grow in excess of 7 per cent – the fastest amongst large global economies – rural India still lags behind substantially. Nearly 300 million people in rural India lack access to grid-connected power, promoting use of archaic sources of energy such as kerosene, diesel, wood-fired chulhas, etc, which not only results in huge government subsidies, but also substantial health and environmental hazards. 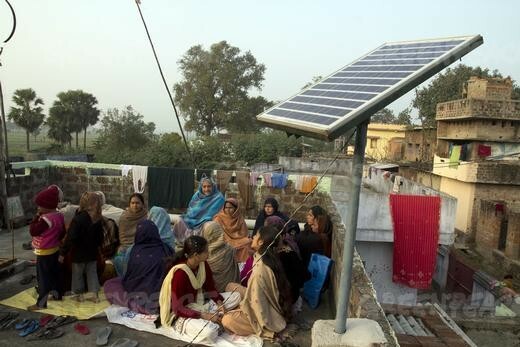 The decentralised and modular nature of solar power makes it easy to deploy for multiple rural applications, impacting key facets of rural population such as productivity, safety, health benefits, access to clean water, heating solution and livelihood. Solar lighting, for example, not only provides a high quality solution to improve rural productivity, but also substantially reduces health hazards by enabling replacement of kerosene lamps. Even 4-5 hours of additional lighting can improve productivity and income of rural household by nearly 30 per cent. Another important application is solar powered agri pumps, which have the potential to substantially improve productivity of Indian farmers. Solar agri pumps are an economic and environmentally-friendly alternative to nearly 26 million agri pumps installed in India, of which 10 million are diesel-fired. Replacement of 1 million diesel pumps could, over its life, improve agricultural output by ₹30,000 crore, mitigate usage of diesel by 9.4 billion litres — translating into a reduction of diesel subsidy by ₹84,000 million and CO2 abatement of 25.3 million tonnes. Clean water remains a big challenge in rural India, since water treatment requires power. Solar energy is finding important applications in this field. For example, Nagaland recently installed a solar powered water treatment plant in Tsiesma, a village near Kohima, which works on an advanced membrane filtration system producing pure drinking water. Other important applications of solar power include access to Internet and television, which can enhance — rural employment, solar-powered basic healthcare centres, solar-powered tablets like those developed by edZilla (which transforming scene of education in rural Karnataka), solar telecom towers, which have potential provide economic , hassle-free solutions to nearly 150,000 telecom towers plagued by unreliable energy supply. The Centre, as always, has a key role to play in expediting this process. It must develop new and affordable sources of solar energy, besides educating the rural masses about the benefits of switching to solar. with associate degree aim to extend renewable capability on the grid from around 57GW in could 2017 to 175GW by the top of 2022. Around 100GW of capability anticipated to come back from star photovoltaics (PV). except for the world’s global climate change agenda a lot of broadly speaking. And there area unit signals that vital investments and a confirmative stance from governments area unit beginning to pay off. fossil fuels on level enjoying field, with new star ,wind currently 2 hundredth cheaper than typical wholesale value for existing coal-fired power. ever-changing markets – India’s Central Electricity Authority has planned the closure of nearly 50GW of coal-fired capability by 2027. “King Coal’s reign in Bharat is on the point of come back blinking down,” wrote Energy Innovations communications director Silvio Marcacci during a Jan editorial for Forbes. The potential for solar power capability in Bharat is gigantic. within the world to capture and use star energy”. nearly 750GW, with 142GW of star resource out there within the state of Rajasthan alone. star PV hovers round the 2 hundredth mark – it yet signals the chance for vast growth within the sector. Bharat last year, adding 7.1GW and pushing the country’s total put in star capability to around fourteen.7GW. with govt estimating around $160bn in capital are needed hit its overall renewables targets. solar battery producing competition and therefore the chance of anti-dumping tariffs on Chinese-made panels. for Bhadla in might if these variables had been clear. I really likes your article…..solar energy is in great demand. Metal 3-D Printing holds a unique position in modern-day product development. The technology can create lighter, stronger parts, and complex shapes that aren’t possible with conventional metal fabrication methods. It facilitates tooling for conventional manufacturing technologies, reducing costs and lead times. It can also provide more precise control of the microstructure of metals. In 2017, researchers from the Lawrence Livermore National Laboratory announced they had developed a 3-D-printing method for creating stainless-steel parts twice as strong as traditionally made ones. Artificial embryos, however, pose ethical questions. What if they turn out to be indistinguishable from real embryos? How long can they be grown in the lab before they feel pain? We need to address those questions before the science races ahead much further, bioethicists say. What’s the solution? Machine-learning tools based in the cloud are bringing AI to a far broader audience. These products will be essential if the AI revolution is going to spread more broadly through different parts of the economy. Android 9 “Pie” is the ninth major update and the 16th version of the Android operating system. But sadly Android Pie is only available for Google devices and flagship devices from other brands. LineageOS Android Distribution is a free and open-source operating system for smartphones and tablet computers, based on the Android mobile platform. It is the successor to the highly popular custom ROM CyanogenMod, from which it was forked in December 2016 when Cyanogen Inc.announced it was discontinuing development and shut down the infrastructure behind the project. Since Cyanogen Inc. retained the rights to the Cyanogen name, the project rebranded its fork as LineageOS. AOSP Extended is an AOSP based ROM which provides stock UI/UX with various customisations features along with the Substratum theme engine. The project has been made by cherry-picking various commits from various other projects. Being based on AOSP it provides a smooth and lag-free experience out of the box. Pixel Experience is an AOSP based ROM, with Google apps included and all Pixel goodies (launcher, wallpapers, icons, fonts, bootanimation). Our mission is to offer the maximum possible stability and security, along with essential features for the proper functioning of the device. ArrowOS is an AOSP based project started with the aim of keeping things simple, clean and neat. We added just the right and mostly used stuff that will be actually USEFUL at the end of the day, aiming to deliver smooth performance with better battery life. Dirty Unicorns is currently a AOSP based project. Started in 2012 by Alex Cruz aka Mazda out of curiosity, he never imagined to see the success this project has today. In the early days this project was a one man show. It was based off AOKP and really had no intention of being anything else. Times change and today we have a full roster of talented developers with huge support from themers, developers and many folks around the community as well as a few OEMs. DU developers are constantly setting the standard for excellence. We have many original features and stability is our main focus. This is Cypher. An extension to pure Android. Cypher tries maintain the purity of Android while offering useful features for users. The goal is to give the highest level of performance whilst achieving Simplicity. This ROM is highly customizable with the most requested features. We keep our ROM clean and as close to AOSP as possible with features added. We keep your phone secure by using the latest and most up to date sources from Google. This is AOSP based ROM with almost stock look and design. Most of the developer are providing weekly updates to improve the user experience. CarbonROM is an aftermarket firmware based on the Android Open Source Project created with the purpose of adding versatility and customization to stock Android. Stability is our highest priority; our vision is to be the best alternative to a stock operating system for your device. crDroid is designed to increase performance and reliability over stock Android for your device also attempting to bringing many of the best features existent today. We’re mainly based on CyanogenMod so use custom kernels compatible with them! In this ROM, your device will be rooted(by Magisk) by default which will basically a good option for those users who are fond of rooted apps. Liquid Remix is a custom rom reborn from the old liquid smooth based on android’s open source project. This is one of the old ROM with great support from developers and official device maintainers. You will get almost stock experience with lot of customisation option.